TSPSC Health Department posts 2018 Recruitment, Apply Online: TSPSC Staff Nurses, Physiotherapists, Radiographers, Paramedical Opthalmic Officers, Refractionists, TSWRDC Health Supervisors Recruitment 2018, TSPSC Staff Nurses, Physiotherapists, Radiographers, Paramedical Opthalmic Officers, Refractionists, TSWRDC Health Supervisors Posts Online application form, TSPSC Staff Nurses, Physiotherapists, Radiographers, Paramedical Opthalmic Officers, Refractionists, TSWRDC Health Supervisors hall tickets, TSPSC Staff Nurses, Physiotherapists, Radiographers, Paramedical Opthalmic Officers,Refractionists, TSWRDC Health Supervisors Answer Key, TSPSC Staff Nurses, Physiotherapists, Radiographers, Paramedical Opthalmic Officers, Refractionists, TSWRDC Health Supervisors Selection list Results, Exam pattern, Selection procedure for TSPSC Paramedical staff, ANM, Lab Technician, Staff Nurses, Physiotherapists, Radiographers, Paramedical Opthalmic Officers, Refractionists, TSWRDC Health Supervisors, Pharmacists and other posts 2018 and more details @ tspsc website. TSPSC Health Department Nursing, Paramedical, Other categories Recruitment 2018/TSPSC Health Department Posts. TSPSC Paramedical Staff Recruitment. TSPSC Nursing & Para Medical posts. Telangana State Public Service Commission (TSPSC) has released the first recruitment notification of the year. TSPSC will begin online recruitment process for the posts of Assistant Librarian, Horticulture Officer, Pharmacist and ANM/ MPHA (F) on 29 January 2018 and the last date for submission of online application is 28 February 2018. Telangana PSC Recruitment to begin on Monday, 29th Jan 2018 for 423 Vacancies. TSPSC Recruitment 2018 application process is all set to begin on Monday, 29th January 2018 on the official website of Telangana State Public Service Commission (TSPSC) tspsc.gov.in. TSPSC aims to recruit candidates for four different posts viz ANM/ MPHA (F), Pharmacist, Assistant Librarian and Horticulture Officer. In a series of notifications released on its website, the Telangana State Public Service Commission (TSPSC) announced the beginning of Direct Recruitment from 29th January and the last date to apply for the same as 28th February 2018. As per the notification, the examination dates will be announced at a later stage. “The Examination (Objective Type) dates will be announced later. The Commission reserves the right to conduct the Examination either computer based recruitment test (CBRT) or offline OMR based Examination of objective type” stated the advertisements. Application Fees: Candidates have to pay Rs. 200/- as application fees plus Rs. 80/- as examination fees. How to apply: Willing and desirable job seekers may apply online for this post from the official website of TSPSC till 28th February 2018. The applicant must fall in the age bracket of 18 to 44 years. Age relaxation rules apply as per the state’s benefits to state government employees, ex-servicemen, SC/ST/BC/NCC/PwD candidates. The Examination (Objective Type) dates will be announced later. The Commission reserves the right to conduct the Examination either computer based recruitment test (CBRT) or offline OMR based Examination of objective type. Pharmacist Gr.II: 390 :: Candidates must have obtained degree in Pharmacy. :: Rs. 21,230 - 63,010/- per month. The Telangana State Public Service Commission (TSPSC) has issued notification for recruitment of 1261 various posts in Health Medical & Family Welfare Department, Insurance Medical Service and Telangana Social Welfare Residential Degree Colleges (TSWRDC) Women. Of the total posts, 1196 are of staff nurse in Directorate of Public Health and Family Welfare (DPH&FW), Telangana Vaidya Vidhana Parishad (TVVP), 35 radiographers in DPH&FW, 21 Health Supervisors in TSWRDC (Women), six physiotherapists in TVVP, two Paramedical Opthalmic Officers in DPH&FW and one refractionist in Insurance Medical Service. The TSPSC in a release on 08-11-2017 advised candidates to visit its website www.tspsc.gov.in for detailed information. Submission of online application will begin from November 16 and last date to apply is December 28. Applications are invited online from qualified candidates through the proforma application to be made available on commissions website for the Notification pertaining to the various posts in the following departments in the state of Telangana. The candidates are advised to visit the commissions website for detailed information. The submission of online application is from 16-11-2017 and last date for submission of application is 28-12-2017.
b)Two years Diploma in Para-medical Ophthalmic Assistant Course from Government Recognized Institute. The Fee mentioned at Para-I(6)(a) is to be paid online through SBI ePay duly following online instructions once the application form details are submitted by filling TSPSC ID, date of birth and other particulars. The fee once remitted, shall not be refunded or adjusted under any circumstances. Failure to pay the examination fee, application fee, wherever applicable will entail total rejection of application. The list of Banks providing service for the purpose of online remittance of fee is given. 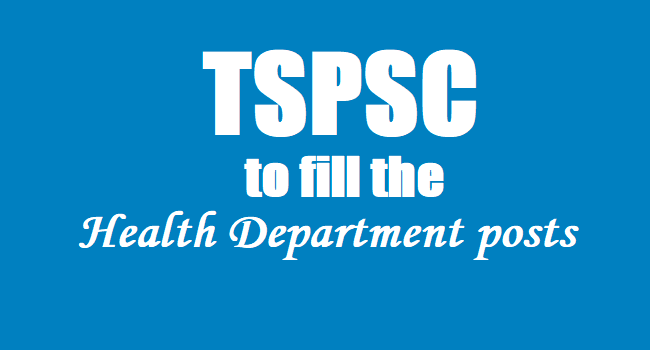 TSPSC to fill 660 Health Department posts: Government accorded permission to fill 660 posts in the State Health, Medical and Family Welfare Department through the Telangana State Public Service Commission (TSPSC).According to Govt Order, 148 posts will be filled in the Directorate of Medical Education. The total posts to be filled in Directorate of Public Health and Family Welfare will be 457 and another 55 vacancies were identified in Telangana Vaidya Vidhana Parishad. The administrative department concerned will furnish details of all the vacant posts, including local cadre wise roster points, qualifications and etc., to the recruiting agency with intimation to the Finance Department. Public Services – Health, Medical & Family Welfare Department - Recruitment - Filling of (660) Six Hundred and Sixty vacant posts in Health, Medical & Family Welfare Department, through the Telangana State Public Service Commission, Hyderabad - Orders -Issued. 2. HM & FW (B1) Department U.O.No.2632/B1/2017, dated:06.05.2017. 3. The administrative department and the Head of the Department concerned shall furnish details of all vacant posts authorized in this order, including the local cadre wise / roster points and qualifications, etc., to the recruiting agency immediately under intimation to Finance Department. The Department shall issue necessary amendments to their service rules / Bye- laws / Government Orders changing the existing recruitment procedure/recruiting agency wherever necessary.